A complete guide to the 160 most essential flavors, and their numerous combinations, offering new inspiration for the cook who has everything. In this lively and exceptionally enjoyable book, career flavor scientist Niki Segnit uncovers the essential flavors of food, and organizes them into 160 basic ingredients. In this concise way, she articulates every flavor imaginable, whether it's a "grassy" food like dill, cucumber, or peas, or a "floral fruity" one like figs, roses, or blueberries. And then she considers every conceivable combination of these ingredients. Segnit has scoured thousands of recipes in countless recipe books, talked to dozens of food technologists and chefs, and visited hundreds of restaurants-all in her quest to uncover the planet's essential flavor pairings. The result is a reminder that there are almost infinite possibilities in an everyday kitchen, whether it means spinning celery and dill into a savory broth, orange and carrots into a crisp salad, or cabbage and sage into an elegant cream sauce. This book is also full of quirky observations, practical information (hundreds of recipes are embedded in the narrative) and more than a few good jokes. 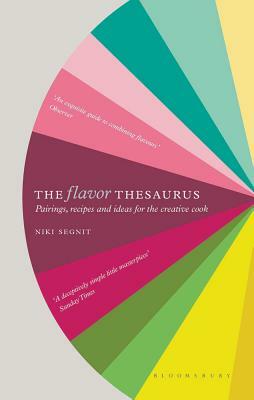 Beautifully packaged, The Flavor Thesaurus is not only a highly useful, and covetable, reference book that will immeasurably improve your cooking-it's the sort of book that might keep you up at night reading. Niki Segnit's background is in marketing, specializing in food and drink, and she has worked with many famous brands of candy, snacks, baby foods, condiments, dairy products, hard liquors, and soft drinks. She lives in central London with her husband.